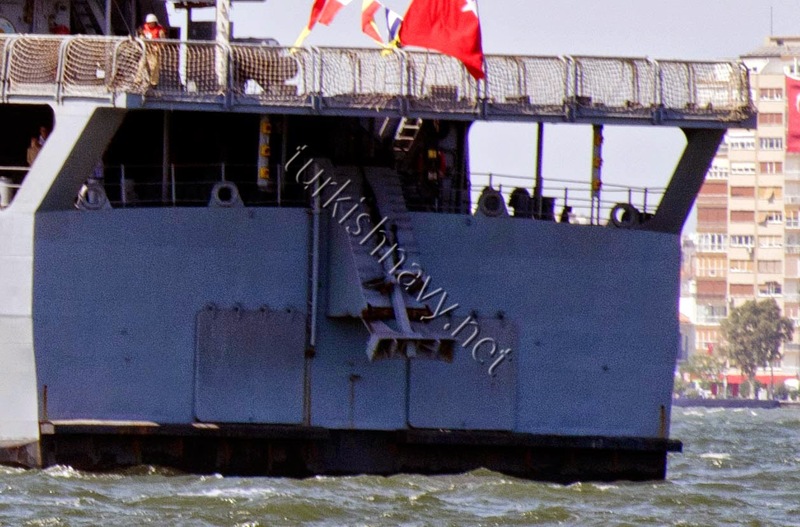 Modified photo of Osman Gazi landing ship/minelayer of the Turkish Navy. For a high resolution image click here. 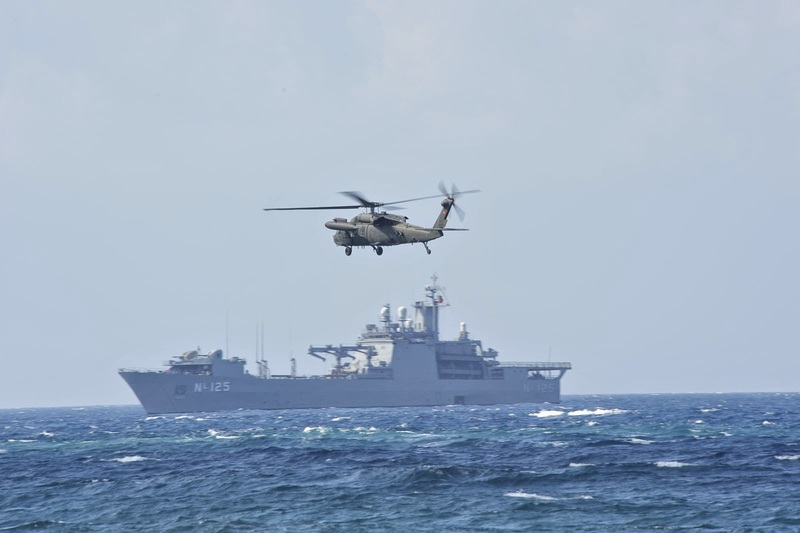 The vessel has a large helideck but no hangar. 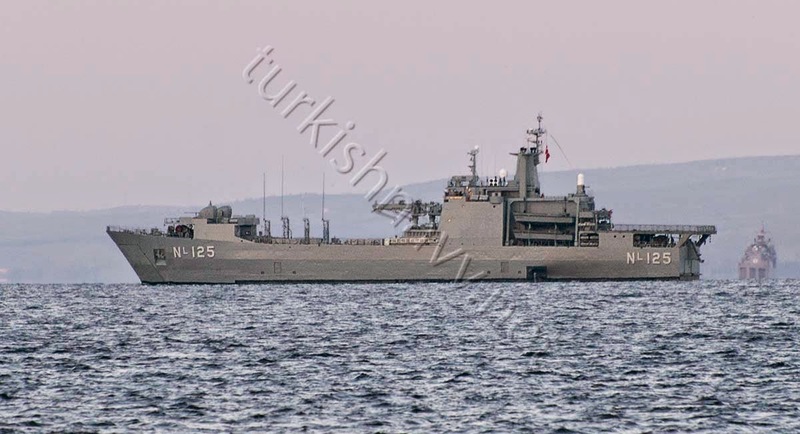 She can carry 900 troops for short periods, 15 main battle tanks that embarks/disembarks from her large bow doors while it carries 4 LCVPs (Landing Craft, Vehicle, Personnel) on davits on the both sides of her superstructure for amphibious operations. In the role of minelaying the ship can carry up to 200 mines. 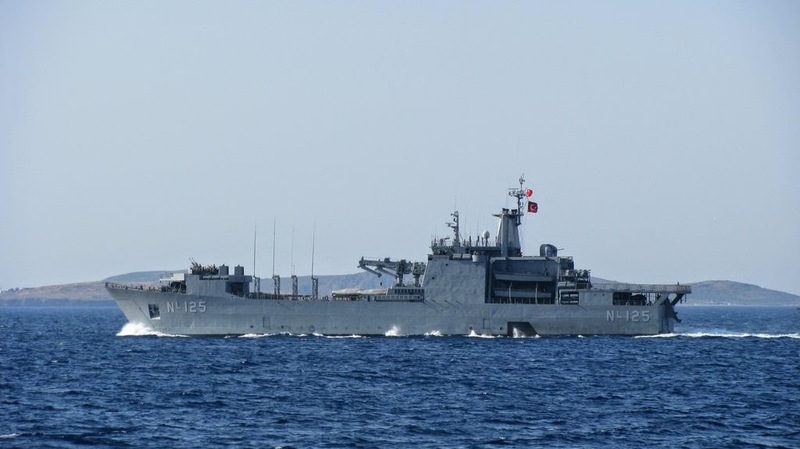 As it was mentioned in the introduction the ship followed an extensive modernization therefore the main weapons systems have been replaced. 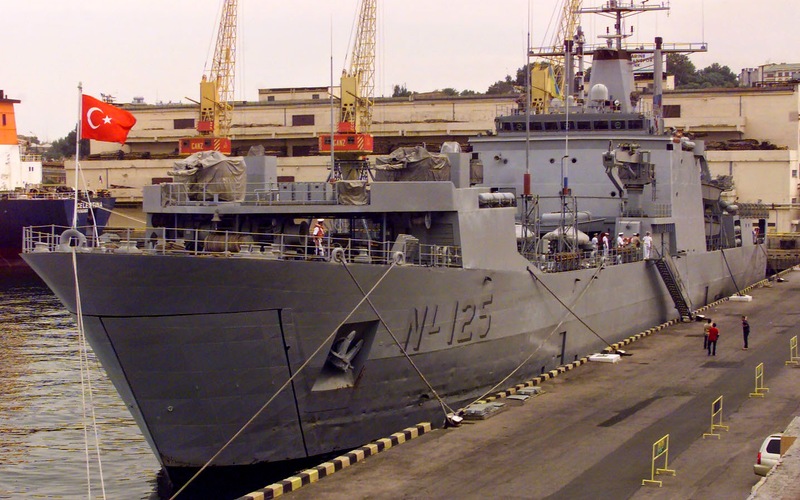 The "new" weapons came from decommissioned ships such as Knox class frigates or Gearing FRAM destroyers. 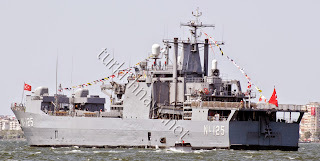 The ships today is equipped on the bow deck with two GDM-A Twin Mounting naval turrets with two Oerlikon KDC 35mm/90cal guns each (Oerlikon Contraves AG changed its name to Rheinmetall Air Defence AG as of January 1st 2009). This system is of dual role; it is intended for anti-aircraft/missile warfare as well as for surface-to-surface warfare and for suppression of ground defenses around the beachhead prior or during the landing operation. 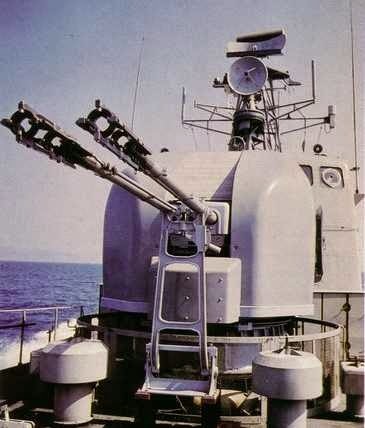 The system has a high rate of fire as each barrel can fire 550 rounds per minute with a range for air targets approaching the 5,000 meters while for surface targets beyond 8,000 meters.The two systems replaced the two Breda Type 64 twin 40mm naval mounts. Osman Gazi during the 100th anniversary of Turkish Çanakkale Victory over the Allied armada. Behind the main mast it is installed a Close-In-Weapons-System (CIWS), a Raytheon Mk15 Phalanx, a very popular system worldwide in this role. The Phalanx replaces the GDM-A Twin Mounting naval turret, the system that was used in this role before the modernization program, and that now it is installed on the bow deck together with another one from the storage. The Phalanx is a rapid-fire, computer-controlled, radar-guided gun system designed to defeat anti-ship missiles and other close-in air and surface threats. A self-contained package, Phalanx automatically carries out functions usually performed by multiple systems – including search, detection, threat evaluation, tracking, engagement, and kill assessment. The block that belongs this Phalanx is the old Block 1, and thus the system lacks the stabilized Forward-Looking Infra-Red (FLIR) sensor, the automatic acquisition video tracker and the other improvements which have the newer models such as the Block 1B. 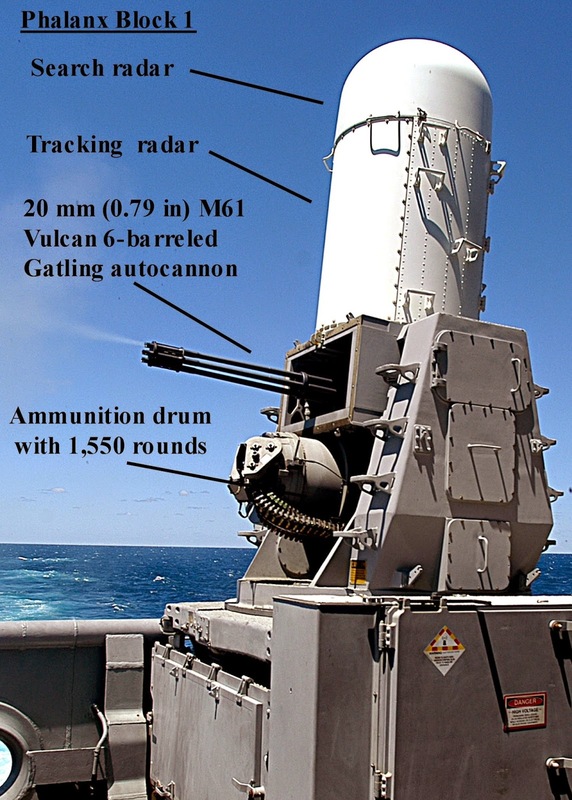 The armament consists of one 20 mm (0.79 in) M61 Vulcan 6-barreled Gatling autocannon that has an effective range of more than 3.5km and a rate of fire of approximately 3,000 rounds (!) per minute with a magazine drum holding 1,550 rounds. The Block 0 held 989 rounds. In then ear future it is expected that the Phalanx will be upgraded to the latest configuration, Block 1B Baseline 2. 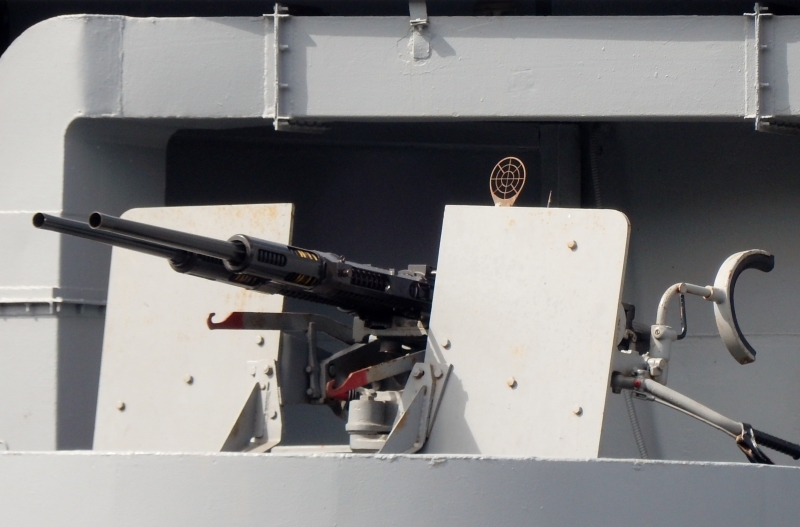 Oerlikon twin 20mm gun mount. 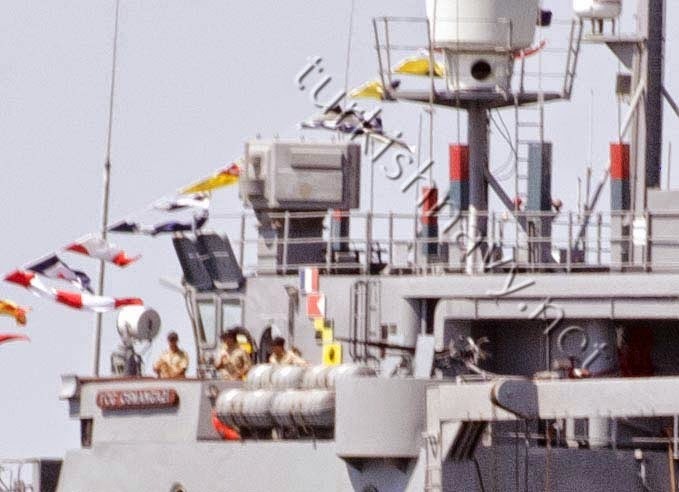 In addition to the weapon systems described above, Osman Gazi is armed with two M2HB (Heavy Barrel) 12.7mm heavy machine guns in front of the helideck and two twin Oerlikon 20mm L70 on each side of the superstructure. The M2HB has a maximum (effective) range of around 1,830m and a cyclical rate of fire of about 500-600 rounds per minute.The Oerlikon 20mm gun has a maximum firing range of less than 4,500m while the rate of fire is close to 450rds/min. 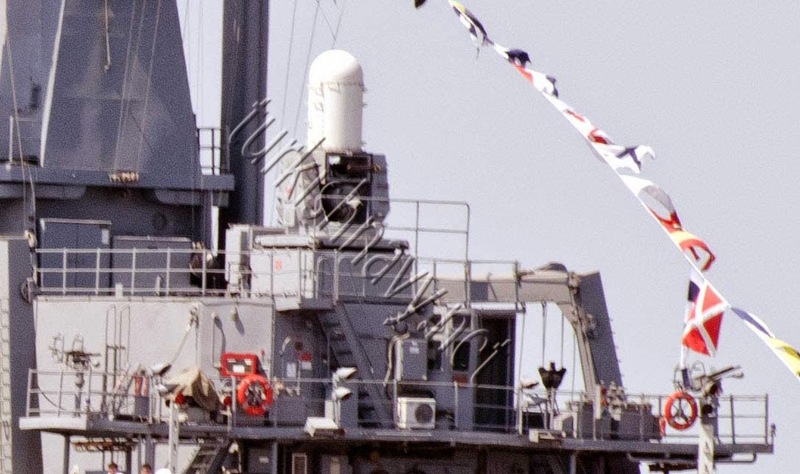 The recently added Phalanx CIWS. Notice the mounts for M2HB heavy machine guns immediately below. It is noticeable the significant addition of two Raytheon SLQ-32(V)2 EW antenna groups above the pilothouse. 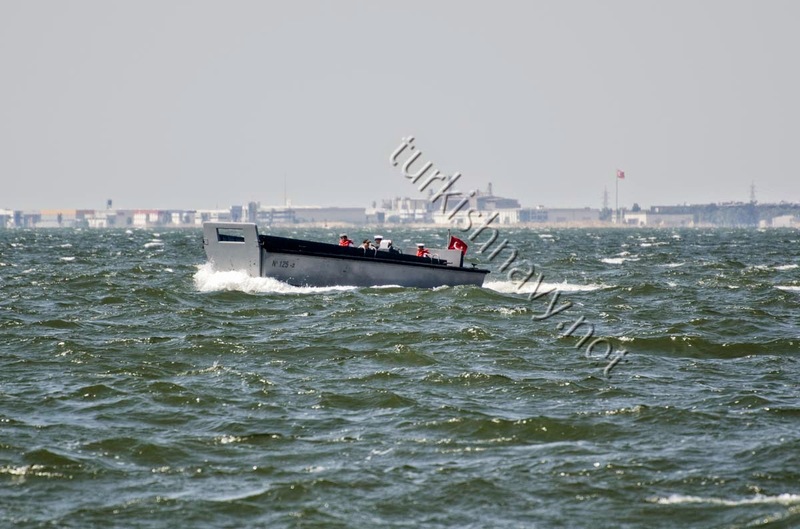 The excellent website turkishnnavy.net, which is the main source of this article as the official Turkish website lacks comprehensive information and photos, reports that the two systems must have been taken from a decommissioned Knox or those Perry class frigates that were given for spare parts/cannibalization. The SLQ-32(V) is the principal EW system carried by major US Navy surface ships, with more than 450 systems produced to date. The (V)1 and (V)2 suites are passive, providing early warning, identification and direction finding capability for simultaneous multiple threats. The SLQ-32(V) system has been in operation around the globe since the 1980s, and ongoing efforts to restore and upgrade older systems will extend the life of the SLQ-32(V) well into the 21st century. The system achieves EW objectives by providing full threat band frequency coverage, instantaneous azimuth coverage, 100 percent probability of intercept and simultaneous response to multiple threats. It can detect aircraft search and target radars well before they detect the ship. 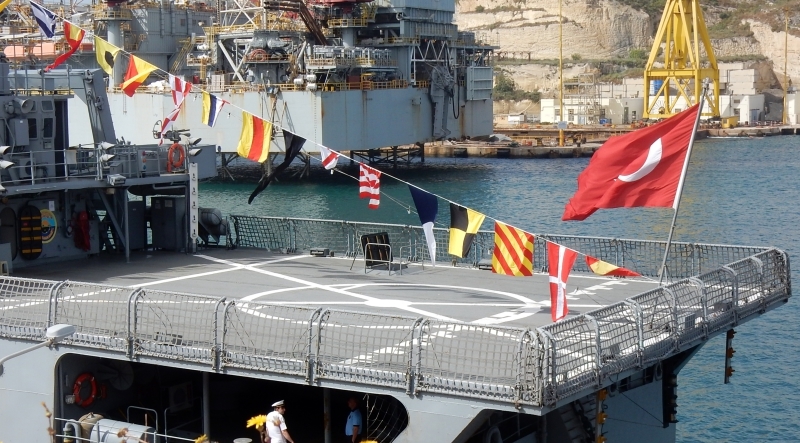 The system's rapid response time ensures that jamming protection is enabled to prevent long range targeting of the ship and to deceive missiles launched against the ship. The system has an on-line library of emitter types for rapid identification. The two small doors at the stern of the ship are used for mine laying. The modernized/upgraded Osman Gazi. Photo by Alper Boler. The ships is not complete yet plus there are no high resolution photos yet of it. So, for the moment I can't analyze it. But thank you for the suggestion!